There is something irrational about participating in Ironman-distance races : running a marathon after hours of swimming and biking, doing that within one day, aiming to finish before the time limit, enjoying the excitement, the effort, the pain and the pride. It seems reserved to an elite few with superior capabilities, willpower and a perfect lifestyle. Organizers and athletes sustain this image because it just makes them look good. But reality is different : it is also made of a lot of doubt, a fair amount of junk food, regularly snoozing the alarm clock and delaying training sessions. After registering for this year’s EmbrunMan, known as one of the world’s toughest Ironman-distance triathlon because if the mountainous terrain in the French Alps, I downloaded a training plan on the internet. Not a great idea ; next time I’ll get a coach again. 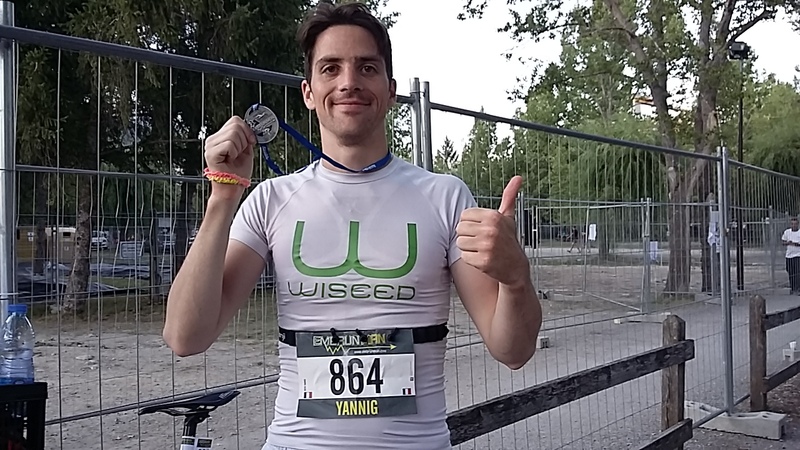 Anyway, my shape was good (1h run, 1h swim and 2-3h cycling a week) but not fantastic, and certainly not at the level that people would describe as Ironman-worthy. The plan spanned 26 weeks with 5 to 6 training sessions a week. On average, each week I was supposed to swim a total of 2,5 hours, bike 6,5 hours, and run 3 hours, which is 12 hours in total. It was too much, but I didn’t know that yet. Even if for Ironman France I did a bit more than 9 hours, I thought I could handle it. And if I couldn’t, then I would just try to come closest to that number. Below are the hours I was supposed to put in, to which I added a trend line to illustrate the overall word load over the 26 weeks. These were 309 hours in total, of which many are to be spent on the saddle. Regular training in the pool and by foot are also necessary, but it’s always cycling first, in terms of training schedule. That’s for the theory. In practice, how much did I really do ? Below is the same chart with my actual training, a bit more than 8 hours per week on average. Luckily, the swimming and running bases are still there, and the two big blocks on the saddle can also be recognized. I biked less – even less than I ran at one point – than planned, and it’s the same for the two other sports. But it’s not too bad neither, it’s still a good 8 hours a week on average. I did the job, but I did it less than I was supposed to. Instead of 60 hours of swimming, I did 25 ; instead of 171 hours of cycling, I did 124 ; and instead of 78 hours of running, I did 61,5. There were weeks I didn’t do all of the 3 sports, and even one where I didn’t do anything. A lot of this is due to varying motivation along the way, because I was always physically fit and perfectly able to train. Beside the relative lack of training, it’s also important to take professional workload & travels, rest & sleep time, or nutrition into consideration. I don’t track all of these (I wasn’t happy with the fitness band I used), but I do know that I switched jobs in the middle of the training period, with a lot more work and travel. And I do track nutrition, which I know was sub-optimal over the 189 day period : 62 days were bad in terms of nutrition. But put aside all these aspects, these failures to prepare perfectly (a purely theoretical concept), I’m aware that engaging in such ambitious leisure endeavours is not a given for everyone, I am a healthy person and I haven’t suffered any injury, I’ve been fortunate to be supported by my loved one(s), I have discovered great places to swim/ride/run, I had a fair amount of fun along the way. Don’t equate long-distance races with absolute dedication, that would be plain wrong. Sometimes you prefer the pizza, sometimes you cut your training in half, sometimes you don’t do the brick you planned. Sometimes you shed tears. Not the I-cry-because-I-pushed-myself-to-the-limit type of tears, but the I-just-feel-exhausted-and-weak type of tears. They’re probably also will-I-really-be-ready-with-so-little-training type of tears too. It’s not about priding myself to having finished with little training (I hate when people do that and I hope it doesn’t come across as such neither), it’s about saying that, whatever image you have of Ironman athletes, don’t think that they have mastered everything in life. You see a smiling finisher who concludes months of quality training. I feel like a participant who hasn’t dedicated himself enough. The finishers will post the best pictures of themselves on social media, the magazines will show HD-photos of the athletes and their expensive equipment, it will look fast and hard, the Ironman® brand will market itself as something for iron men only. They’re selling everyone the dream to become a bad*ss m*therf*cking Ironman® one day, the supreme title for an athlete. It’s normal to think that Ironman athletes are strong, it’s called the Halo Effect, but they may not be as strong as iron. They’re not stronger than you. They suffer. Maybe we can say that the “iron” stands for “ironing out” the fear, doubts, regret and beads induced by too much cake, no? Everyone can complete an Ironman, really. It just comes down to overall fitness and wanting it bad enough to cross the line. The 16-hours time limit, 17 for Embrunman, leaves plenty of space for pauses and snacks. The feeling of excitement, effort, pain and pride doesn’t belong to a lucky few. No need to do long distances, a simple jog around the park can do the job. If you are tempted by long distances, no need to be a super-human to finish. And those who do finish are no super-humans. You can finish an Ironman-distance race, even in the Alps, after months of training, skipping training, dropping confidence, doubt, good eating, bad eating, waking up early, staying in bed. But I want to be honest and optimistic at the same time. It was incredibly hard, mentally and physically, in either of the 3 sports, before and during the event, which doesn’t shine through in this photo. That’s the beauty of it, the misleading beauty.